CeCe Argan oil catches attention thanks to an unusual, aesthetic packaging – 75 ml plastic bottle has brown – golden colour. It is decorated with a subtle oriental pattern. The applicator is long and narrow and resembles applicators in hair dye bottles. This thin and narrow applicator is supposed to make the dosing easier and keep the oil from spilling. No need to worry: you won’t spill too much of the oil. CeCe product is 100% natural argan oil. That is why it can be used for hair and scalp as well as face and body care. Pure argan oil smells nice. Thanks to the dark bottle, the product won’t go rancid for long months. 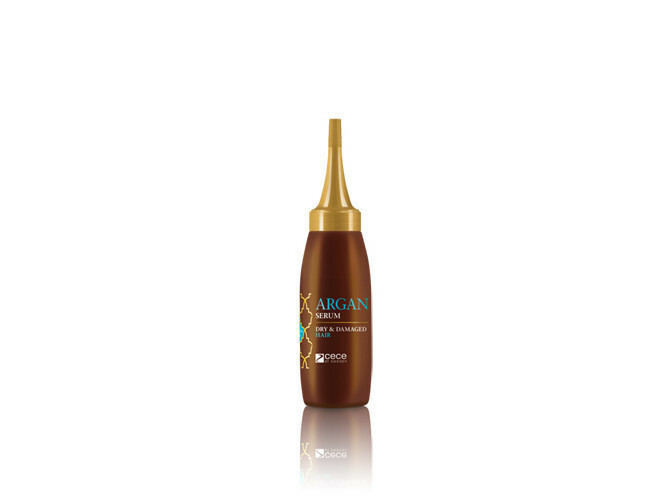 CeCe argan oil is very easy to apply to the scalp – the long and narrow applicator allows for dosing straight from the bottle. Argan oil penetrates deep inside hair bulbs and nourishes them so that hair can grow healthy, strong and beautiful. Argan oil is a versatile oil – not only because it conditions body and face skin. It has an extraordinary ability to balance the level of sebum produced by the scalp. It stops excessive sebum production and greasiness; moisturises the portions of the scalp that are dry and irritated. What is more, the oil helps to fight the dandruff and prevent its recurrence. Argan oil is an elixir of youth: high concentration of vitamin E helps to fight free radicals; the oil prevents the occurrence of wrinkles and smooths the wrinkles that have already appeared. CeCe argan oil can be used in several ways. It can work as an oil for massage which moisturises, nourishes the skin and helps to get rid of cellulite. As a hair conditioner – repairs and protects hair as well as strengthens bulbs to stimulate hair growth. As a serum for damaged hair ends – protects from total damage. As a styling product (applied to dry hair prior to styling) – it protects strands from mechanical damage and facilitates styling. CeCe argan oil has a nice design. It is a good quality product in a reasonable price. Unfortunately, 75 ml of the oil won’t last long as you can apply pure argan oil onto hair as well as the whole body and face.